In their second year as official kit supplier, Nike supplied another template from their team wear catalogue. For the first time since the 1999/00 season, the United home shirt came complete with an open v-neck collar. 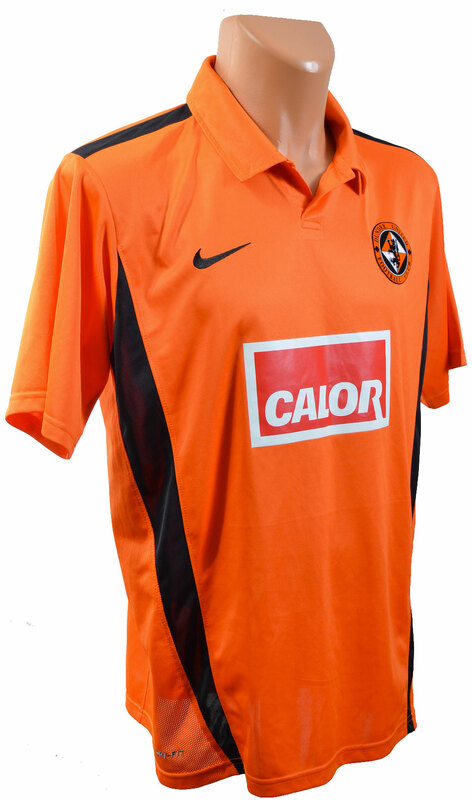 Dundee United reverted back to the standard round club badge, following a year with their centenary design. Two black panels at either side of the top stretched vertically from sleeve to the base. A black stripe was also present running across the top of both shoulders. Nike again used their DRI-FIT technology in their material selection. Unfortunately, some controversy surrounded the Calor logo used on the front of the shirt. For the first time in recent memory, red was introduced to the United home top as part of the sponsor design. The Calor logo was defined in white text on a red backdrop. 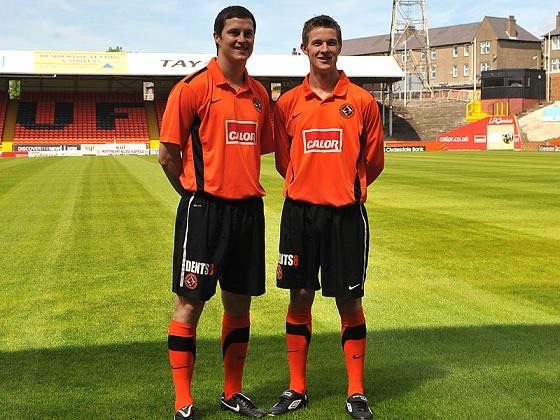 The red however clashed terribly with the tangerine shirt and some argued, spoiled an otherwise nice kit design. Calor also had their sponsorship on the back of the shirt. Again in red and white, the logo reading ‘LPGenius from Calor’ was positioned just below the folded collar. Black shorts and tangerine socks completed the kit, with Dents8 continuing to sponsor the shorts. Clydesdale bank sponsorship was again located on each sleeve. The player names and numbers were black with white trim. At the bottom of each number was a print of the SPL trophy. United first played competitively in the kit at St Mirren Park on the 14th August 2010. Jon Daly scored in the last minute to earn a 1-1 draw. Interestingly, United were forced to wear white shorts with the home kit for the first time, when they played AEK Athens in the UEFA Cup on 26th August 2010. This was to avoid a clash of the two sides black shorts. The fact that the only attendees were the 500 or so travelling Arabs, made for a surreal occasion. Their last game in the outfit came at Tannadice on the 15th May 2011, when goals from strike stars Daly and Goodwillie earned United a 2-1 victory. United’s best result in the 10/11 home kit was a 3-2 win at Ibrox against Rangers on the 2nd April 2011. United had to come from behind to clinch the match with late goals from Russell and Goodwillie.